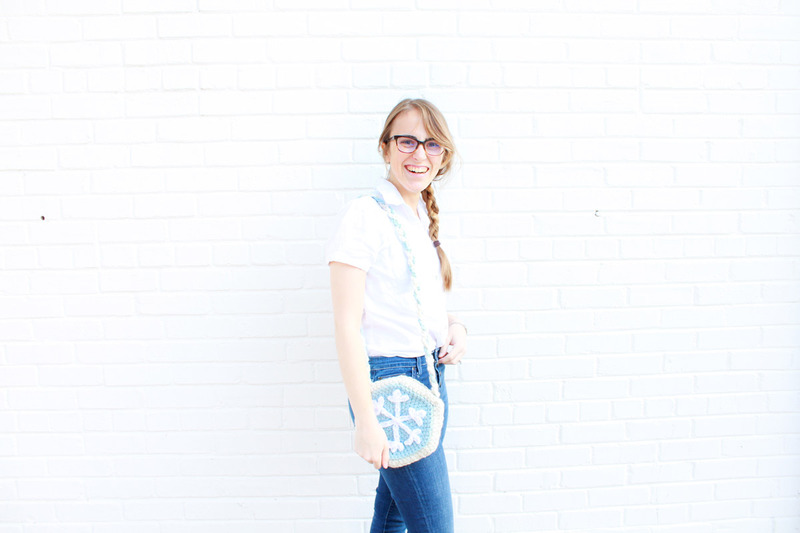 Claire Goodale is the owner, designer, and maker behind E'Claire Makery. When she's not obsessing over yarn and coming up with patterns, you can find her out exploring, baking, watching superhero shows, and enjoying her newly married life with her husband Stephen. As a maker, her goal is to help people have no fear in making so that they can create the handmade items of their dreams. Hi makers! My name is Claire Goodale, and I'm the owner, designer, and maker behind E'Claire Makery. I've been crocheting since my Grandma taught me one winter's night when I was 7 years old. 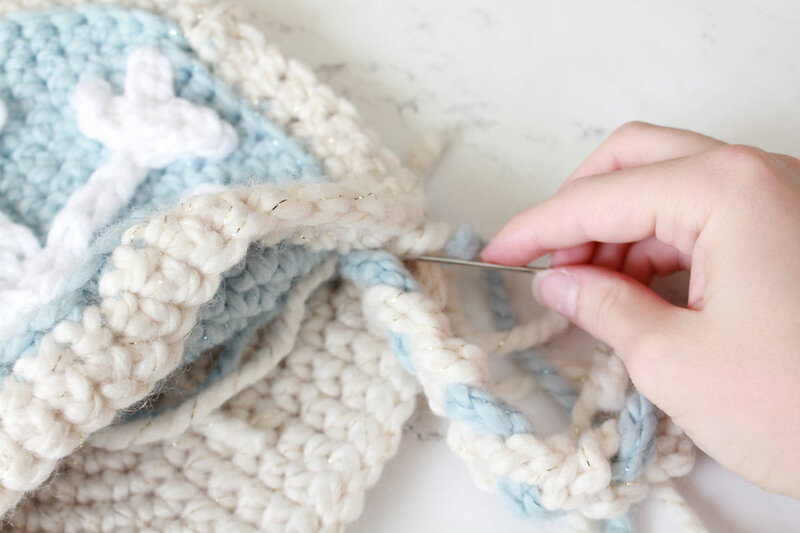 As soon as I picked up the crochet hook and yarn I was completely hooked. Ever since then I've tried to learn every fiber art out there, but crochet will always hold a special place in my heart. Throughout the years, crochet became something that I grew to love very deeply. I knew when I was 13 years old that I wanted to be a crochet designer, for there was something so magical about seeing my designs come to life into something that I could share with people. I wanted to start my blog and business in high school and the beginning of college, but I developed chronic health issues that debilitated me to be bed ridden. Crochet and knitting were the only things that I could really do, and so they became a part of me. This year I finally got the confidence, with some motivation from my husband Stephen, to start my blog and business E'Claire Makery. My goal in my business is to help people have no fear in making, so that they can make the handmade items of their dreams. I create crochet tutorial videos, blog posts, and patterns that try to make the crocheting process as easy as possible. For myself, I've learned that I can never go back to not being a maker. I love it! Ever since I discovered Jessica's blog, I've been so encouraged in my maker journey through her inspiring words to go for your dreams! 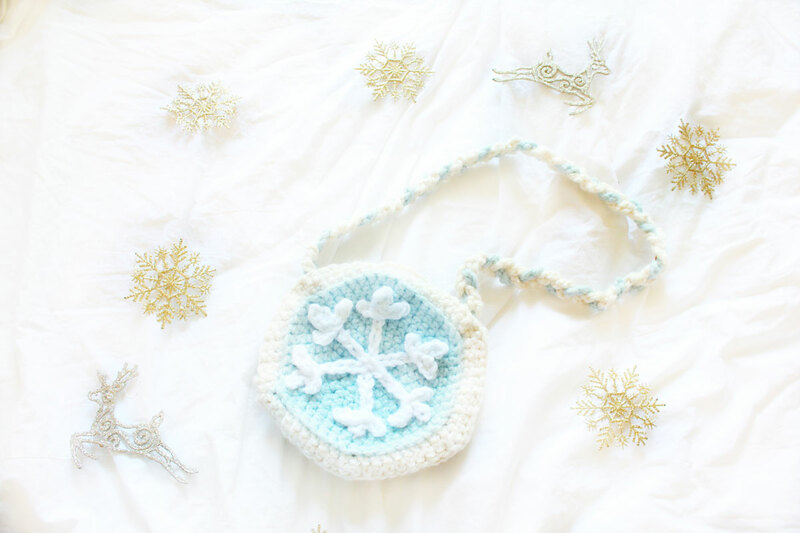 I am so excited to have the opportunity to share one of my favorite designs I've created especially for The Hook Nook Life Blog: my Snowflake Sugar cookie purse. 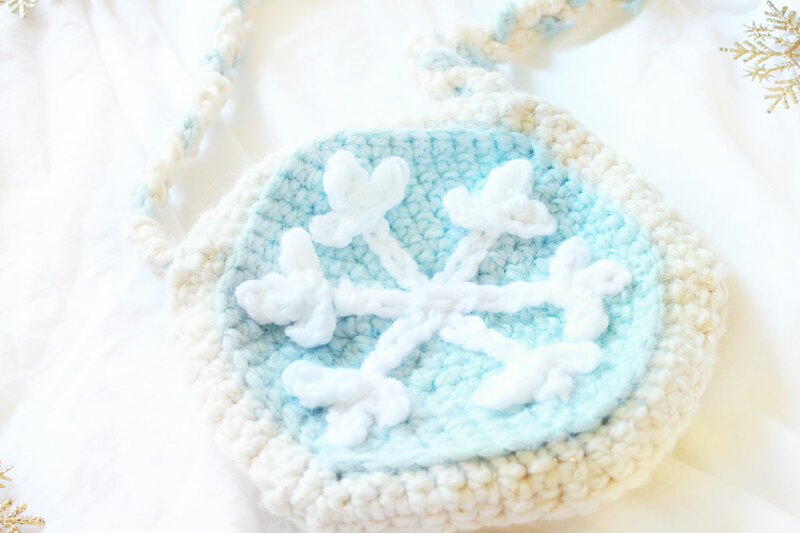 This purse is made from Lion Brand Wool Ease and Bernat Soft Chunky Yarn, which creates a soft and pretty fabric to capture this sweet dessert design. Almost all of my designs are inspired by my love of food and baking, and so I was super excited to make this holiday inspired cookie. It's the perfect size for all of the holiday occasions you may have from Christmas parties, visits with Santa, ugly Christmas sweater Parties, or for giving as a gift to hold lots of holiday goodies. Let's get started! Fasten off, leaving a long tail for sewing. 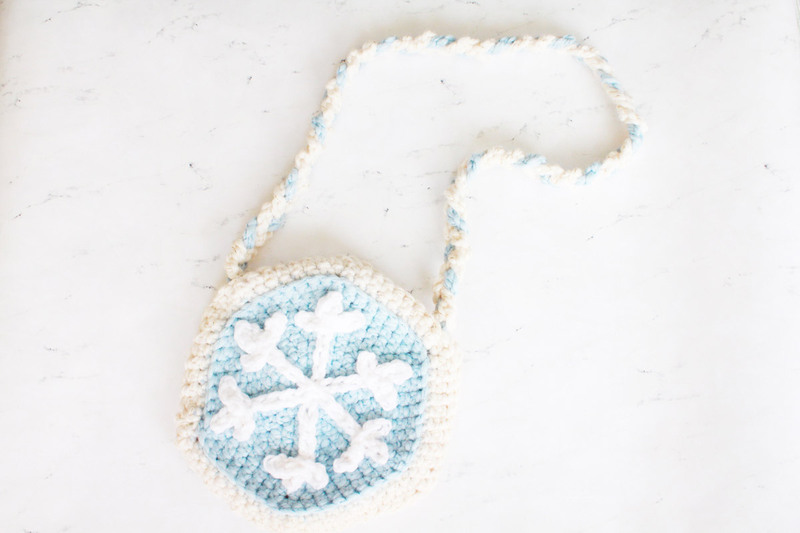 Set both the front and back pieces aside till after you sew on the snowflake to the front. 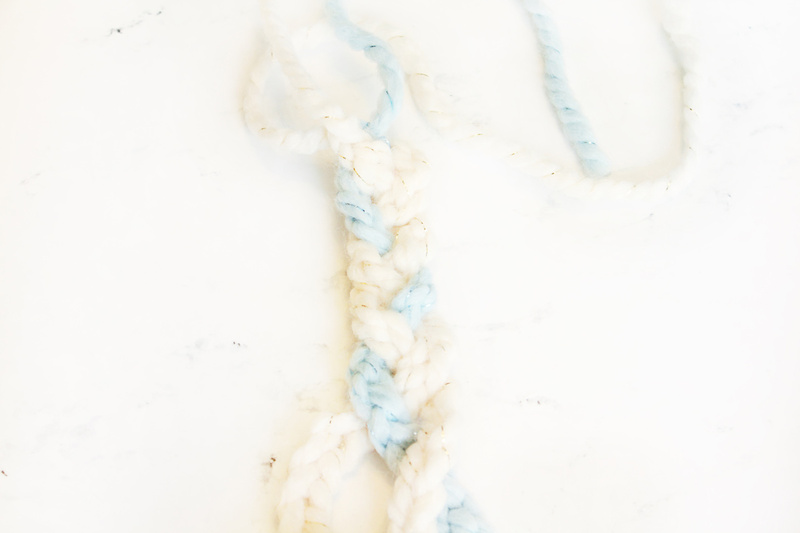 Ch 17, (starting in second ch from hook Sl st 3, *ch 3, starting in second ch from hook sl st 2, sl st in the 3rd sl st on main piece* repeat once, fasten off) repeat this on the side of the chains with the slip knot by slip stitching into the first chain. Position the pieces of the snowflake as seen in the picture below, matching each end to one of the curves of the cookie. Then sew the pieces on. I position and sew them on one at a time. 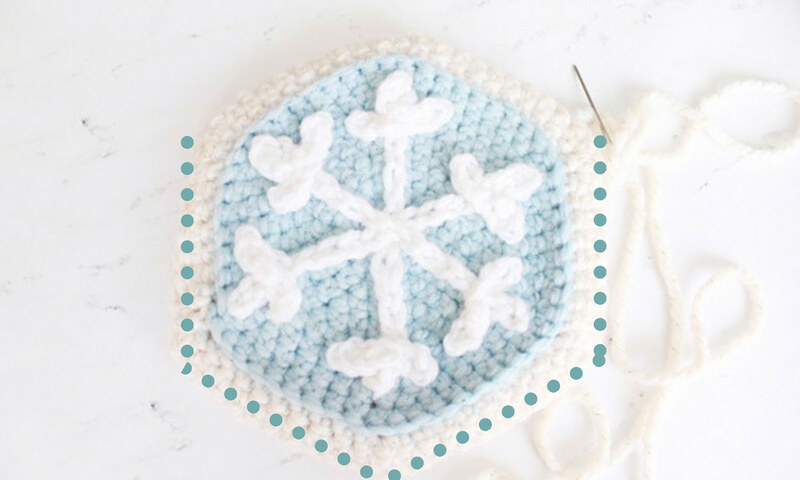 Fasten off and weave in ends once each snowflake piece is sewn on. Sew two pieces together by sewing along the edge, as pictured above with a dotted line, leaving an opening at the top. ch 110, fasten off leaving small tail for sewing. Take all three pieces of the strap, and position the blue one in the middle of the other two. Sew one of the ends of all three together, and then braid the three strands till you reach the end. Then secure the braid by sewing the other ends together. To sew the strap onto the purse, position the strap inside the purse as pictured below and then sew both ends to purse. If you enjoyed this pattern design, you can find more of my patterns in my Etsy and Ravelry stores, or on my website and blog. I can't wait to see what you've made! Be sure to tag me on Instagram @eclairemakery, so I can share the lovely purses you'll create. Have a wonderful Holiday season!